* For bathrooms up to 70 - 140 sq. ft. For other rooms up to 75 - 145 sq. ft.
* QTRE080 & QTRE110 models meet Energy Star Standards and are California Title 24 compliant. * 11.8 - 15.4 Lbs. 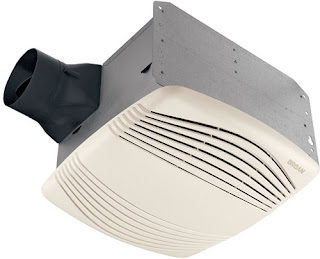 Housing: 11-3/8" x 10-1/2" x 7-5/8"
Broan exhaust fans are among the quietest products in their category. 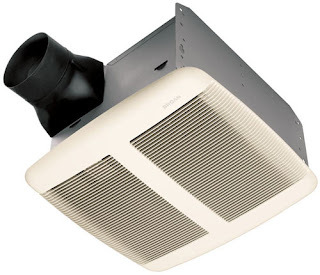 Both vent fan series have the ideal design solution for any bath or powder room. These fans are for bathrooms up to 70 - 140 sq. ft, and other rooms up to 75 - 145 sq. ft. These fans ship via UPS or FedEx and have a 3 year warranty. Thanks for the post. I have read your whole post and I really liked it. Great Work! !